Imagine having a magnum or a rocket-propelled grenade served for dinner. Or how about a bite of Claymore or AK-47? Sandbags cover the exterior - a grim, and perhaps inadvertent, reminder of what Lebanon's government buildings looked like during the 1975-1990 civil war - and the interior is festooned with camouflage nets, defused mortar shells, and live ammunition. "We thought at the beginning that it was a weapons store but later we discovered that it was actually a fast food restaurant," said customer Amr Nahas as he ordered a "magnum," a grilled chicken sandwich, with a side order of "grenades" or potato wedges. Customers enter the restaurant under a sign bearing the restaurant's name - in English - and motto, "a sandwich can kill you," a reference to the large portions. 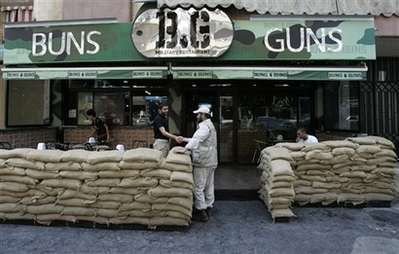 Employees in military uniforms serve meals to the taped sounds of gunfire as "background music." 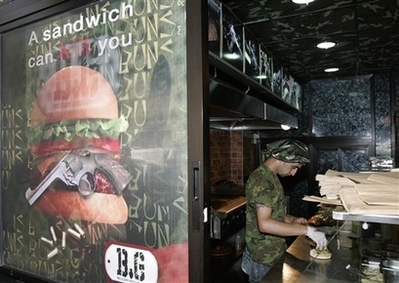 The glossy camouflaged menus feature burgers with names like "the mortar" and "the 155 mm howitzer," while grilled chicken sandwiches can be a "magnum" or a "rocket-propelled grenade." Go to yalibnan.com for more. Way to be different hey! 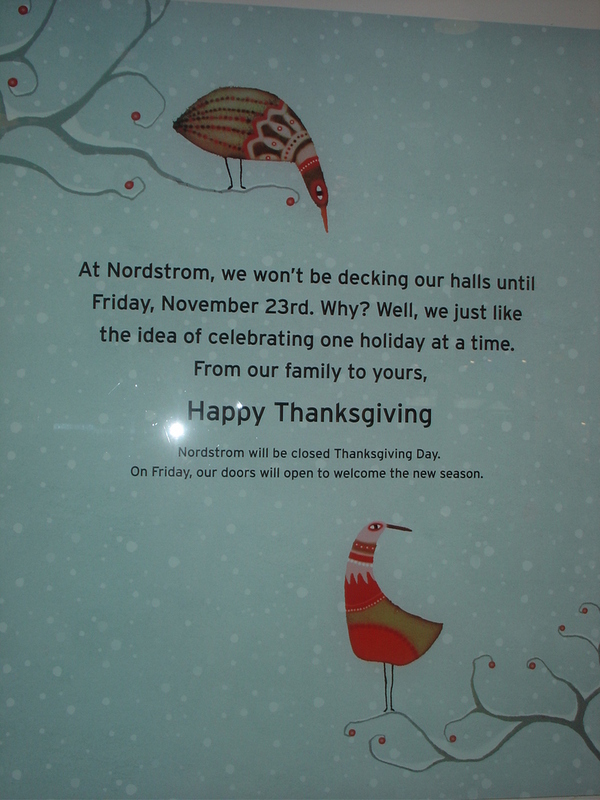 Nordstrom is the only retailer I know of that has always kept this tradition of decking the halls the day after Thanksgiving. There are plenty of people who like to shop for good deals and stock up on Christmas gifts throughout the year, but I think Christmas in July or any other time before black Friday should be banned altogether, people just don't like that. Take a look at the comments at Nordstrom Opposes Christmas Creep and you'll see what I mean. Is it going to be "Black Friday" or "Black Monday" for you this year? And who's going to be hunting for "door busters"? Enjoy a wonderful day with your friends and family.